Today I taught at the Wellness Community. I love that place, and I always learn more than I teach there. Today we made three different burritos and a salsa. Burritos are great. Not only is the one listed below healthy, low fat, tastes great, but it also freezes well. When I was in college I would make up a batch of burrito filling, like the one below, roll up burritos and then freeze them. Then on exam days or when I did not have time to make a great healthy lunch, I could grab one with some fruit and run out the door. By lunch it defrosted and I could munch on it. If you do not want to premake your burritos, freeze leftover filling in individual baggies. Then, you and take one out of the freezer, pop it in the fridge the night before and the next morning, roll your burrito. Hopefully all that gives you some ideas for eating healthy and happy on the go. The following recipe is quick, easy, and tasty. I would pair this with a tangy salsa such as cholula. Enjoy! Drain and rinse the beans. In a pan, heat the diced onions and carrots. 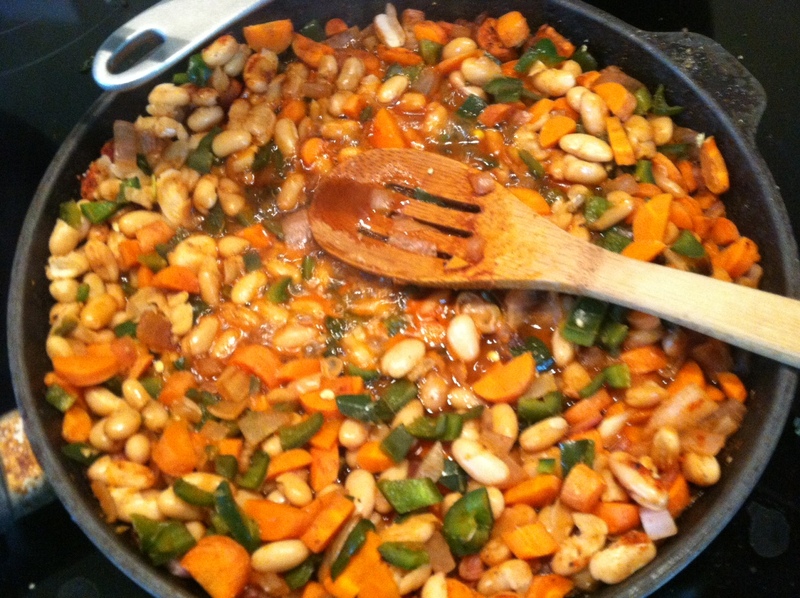 Once the onions are translucent and the carrots start to sweat, add the beans. 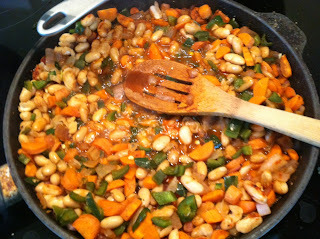 Add a small amount of the broth to keep the beans from sticking. Add the paprika, salt and pepper. Seed and mince the pepper if needed, add the peppers. Once the carrots are slightly tender, mince and add the fresh oregano. Cook another minute, then remove from heat. Roll up in a tortilla and enjoy.